Today, I’m interviewing Frank Viola, an author who writes on church, faith, and other topics in out-of-the-box ways. Frank has published a number of books in a variety of formats, so I thought he would add an interesting perspective to the conversation here, especially with his experience blogging. Jeff Goins: How long have you been writing, and how did you get started? Frank Viola: In the mid-90s, I became the host of what was known back then as Internet “Bulletin Boards.” Bulletin Boards were the precursor to blogs. Every two weeks, I’d write a short article and post it on the Bulletin Board. People would comment on it and we’d have an engaging discussion (much like a blog). As time went on, more and more people began asking me for the articles in printed form. At first, I would print them out on my computer and staple them together. Then someone suggested that I hire a printer to put them into a book. So I tried it. In 2004, a publisher became aware of my self-published stuff and made me an offer to publish it. Knowing that I would reach a much larger audience with a publisher, I accepted the offer. My first published book was The Untold Story of the New Testament Church. Two years later, Tyndale House (via George Barna) wanted to publish my book, Pagan Christianity, and I agreed. Since then, I’ve published with Thomas Nelson, David C. Cook, and Zondervan. To date, I’ve written 10 books. Three are eBooks and seven are published by Christian publishers. I’ve also published many articles. People can view them all on my Mediography page. Earlier this month, I experimented with my first self-published Kindle project. Epic Jesus is the name of that work. Jeff: How do you write a book? Do you have a regular routine? Frank: Christopher Morley once said, “The most valuable writing habit I have is not to answer questions about my writing habits.” In like manner, Hemingway rarely talked about his writing habits, feeling it brought bad luck. However, he did leak them out here and there. And someone compiled a book from those leaks, which I happen to cherish. One way is to select a spoken message I’ve delivered in a conference, have it transcribed, and then shape it into written form. From Eternity to Here is based on messages I delivered in five different conferences in the United States in 2005 and 2006. I did a great deal of editing on those transcribed messages to craft the book. But its origins were those talks given to live audiences. Another way is to combine a series of articles I’ve written into a book. 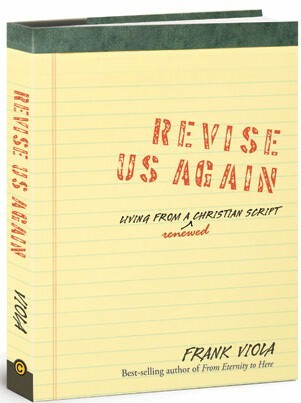 Revise Us Again is an example of this process. About 65% of that book is made up of previous articles I’ve written in different publications. The other 35% is new material. All the chapters are tied together by a common theme. Still another way is to sit down and write a book from scratch. Reimagining Church, Finding Organic Church, Jesus Manifesto, and Pagan Christianity are all examples of this process. The last two were written with co-authors, Leonard Sweet and George Barna, respectively. First, I write a tentative Table of Contents. I usually end up modifying and rearranging it as I write the chapters. But the general framework stays pretty much the same. The Table of Contents is like a map that helps navigate me to where I’m going. Second, I begin writing the chapters. I don’t always write them in order. Instead, I go with what inspires me at the moment. This part of the process is like throwing a lob of clay onto a wheel. The clay is disorganized and without form; I just write my thoughts on the screen. It’s the raw material to work with later. Third, once I’ve gotten some clay on the wheel, the real work begins. This is where I shape, mold, add, remove, and re-write. For me, the art of writing is re-writing. I keep re-writing until something satisfactory emerges. Fourth, once all the chapters are in good form, I print them out and go through them with a red pen in hand — making edits, changes, removals, and additions. Reading the printed manuscript in hand is very different from reading it on the screen. Things I wouldn’t notice or see on the screen suddenly come to light. Fifth, I insert all the changes that I made on the manuscript with my red pen into the document on my computer. This is the part that I hate. It’s laborious and tedious. It reminds me of Peter De Vries’ famous words, “I love being a writer. What I can’t stand is the paperwork.” I wish I could hire someone to do this part of it, but honestly, they would never be able to read my hand-writing. Sixth, I go back and redo steps three, four, and five. Re-write, print out, edit with a red pen, insert edits into the document on the computer. When I’m thoroughly sick of re-writing the book, I wash my hands of it and hand it over to the editor. Like Hemingway, I write best in the mornings. Between 5am and noon. I’m also a plodder. I plod a little each day. Some days I’m highly motivated and can peel off thousands of words at one sitting. Some authors are regimented. They force themselves to write a certain amount of words each day. I tried to play that game and the uniform doesn’t fit. I write when I’m inspired. This is especially true for blog posts. In fact, sometimes I’ll wake up in the middle of the night with an idea that’s burning in me. I’ll get out of bed and write an entire post at 3 am. I rarely do that with books, I’ve done it numerous times with blog posts (and interviews). Interestingly enough, it’s 4:18 am EST right now as I write these words. Incidentally, I enjoy blogging more than writing books. Perhaps because it’s not as grueling. Jeff: Do you have any funny quirks or tricks to get you in the mood to write? Or can you just start? Frank: I was afraid you would ask that. Before I write, I drink a pint of Absinthe followed by a friendly atomic knee drop to my cat (which she loves). I’ll often light a candle on my desk (Peppermint, Jasmine Sea Salt, Honeydew Melon, and Apple Vanilla are favorites). Turn off everything that has sound. I need absolute quiet when I write. So no background music, no television or radio, etc. Jeff: How important do you think tools like Twitter, Facebook, and blogs are for writers and communicators now? Frank: Most of my friends who are authors are introverts. That is, they derive energy by being by alone. I’m an extrovert. I derive energy by interacting with people. For that reason, I’m naturally biased toward social media. Blogs are essential. They give writers a format to hone their craft, test their ideas, receive critical feedback, and connect with those who have the same passions. Last year, I wrote a blog post entitled Twitter vs. Facebook: Reflections, Comparisons, and Ministry Perspective. In it, I likened Twitter to a roundtable discussion and Facebook to a class reunion. I’ve met many great people through both Twitter and Facebook. This alone has made it worthwhile. I joined Google+ this summer, but the verdict is still out on it. Jeff: What’s one piece of crucial advice you have for someone who wants to get into writing books? Frank: Before you write a book, begin blogging for a few years. Blog daily if you can. As T.S. Eliot once said, “Writing everyday is a way of keeping the engine running, and then something good may come out of it.” Hone your skills. Receive feedback, and take it to heart. During that process, hire a professional editor to give you honest criticism on some of your blog posts. If the editor is worth their salt, they will tear your work up in red, making many critical comments. That’s a good thing. It’s what you want. Without it, you’ll never know how to write well. Your friends value your friendship too much to tell you what they honestly think. If you are serious about writing, you simply cannot have thin skin. So hire an editor to give you some straight talk. You may go into depression for a few weeks following, but once you recover, you’ll emerge a better writer. Jeff: Your most recent book is a self-published eBook and seems to be doing well. I understand you gave away a lot of copies of it. Some say there is such a thing as being too generous with your “art.” What do you think — does “free” help book sales, or hurt them? Frank: Epic Jesus is a short book (24 pages), but it’s dense. I’d call it a pregnant book that crams 200 pages of content into 24. On November 1st, we gave away a free copy of the book to our blog subscribers for a 72-hour window. It was a sneak preview. On November 3rd, it was made available on Kindle, Nook, and PDF for $3.99 USD. For the first three weeks of its release, the book stayed around #16 in “Christian Living” on Amazon Kindle. I was amazed by that, especially after we had given the book away to thousands of people just days before. It was humbling. We regularly give away free resources (sometimes books) to our blog and newsletter subscribers. Since I don’t profit personally from my books, sales aren’t too big of a deal to me. Consequently, I’ve never researched whether or not our giveaways helped or hurt sales, and honestly, I wouldn’t know how to track that if I wanted to. For an author, comments like that have a tendency to make one’s day. Jeff: When you work on a book, you sometimes stop blogging. Is there a tension between writing for now versus writing for later? How do you balance this? Frank: I began blogging in the Summer of 2008. From then until May of this year, I’ve been able to blog while writing books. But in May, I took up a new book project that’s formidable. So I began my first blog sabbatical from then until now. I’ll be finished with the book project in mid-January and plan to resume blogging then. Interestingly, the subscription to the blog has almost doubled since I’ve been on the sabbatical. Each day new people find the blog, read some of the posts in the archives, and subscribe. This is encouraging, and I didn’t expect it. Regarding blogging, I typically have several bloggable ideas per day. So I have a blog queue on my computer in which I type in those ideas. Sometimes I’ll write an entire post based on one of those ideas. I then queue them up for publication at a later time. At the moment, I have over 100 blog posts queued up for when I resume blogging. And in my judgment at least, they are among the best I’ve written so far. Jeff: What did you do to get to the top of a list on Amazon? Frank: Shortly after George Barna and I released Pagan Christianity, someone suggested we do an Amazon campaign to make more people aware of the book. So the marketing people at Tyndale sent out special mailings, asking readers to purchase the book on a certain day from Amazon. George and I sent out a mailing to our subscribers, letting them know about the campaign also. Interestingly, we launched the campaign a full month after the book had already released and thousands of people had already purchased it. Even so, on the day of the campaign, the book hit #11 out of all books on Amazon. I believe we would have had a good shot at hitting #1 if we started the campaign when the book released. But we were a month late. Perhaps, the lesson here is that if an author has enough people who believe in what she or he is doing, those people will support their work in dramatic ways. Some of my readers have told me that they were happy to support the books in this way, especially because we had given away so many free resources over the years. I guess this brings us back to your earlier question. Perhaps giving away free resources does help book sales down the road somehow. Undoubtedly, other authors have tracked this and can give a more accurate answer than I can. You can connect with Frank on his blog and follow him on Twitter: @FrankViola. Thanks Jeff. I’m humbled and honored to be a guest. Your blog is impressive. I hope what I’ve shared will inspire others to write what’s on their hearts. Man there are some gems in this post. Thanks for the advice and sticky quotes Frank…very helpful stuff. Lots of great content Jeff. Really enjoyed reading Frank’s answers and the knowledge he provided. This was a great interview. Thanks for transcribing it for us. I look forward to our chat this week or next. A very informatve and helpful interview. Thanks! I usually lurk ’round here, mainly because of time. But I always, always enjoy reading your stuff. This is the type of honesty I need. This was a great “meat and potatoes” type of post. No fluff, just the real stuff. Thank you for this. Thanks for the comment, Jamie. Try just starting. I LOVED this! Just what I needed to read today. Great interview. Great interview — thanks for sharing!